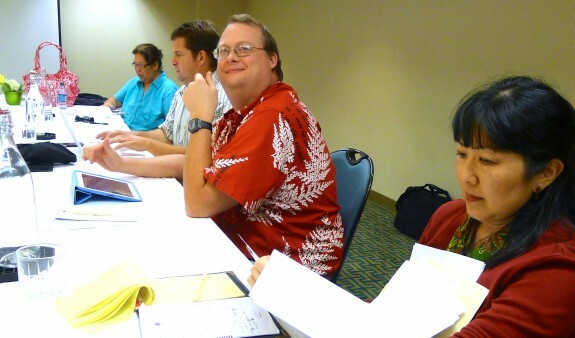 Members of the Hawaii Tribune-Herald bargaining committee caucused during talks Wednesday and Thursday in Honolulu. Management has shown little interest in serious bargaining, refusing to narrow a huge list of takeaway demands including a big jump in health care costs, pay freeze, end of seniority protection against layoff, unfettered right to subcontract two departments and onerous “social media policy.” From left, Heather Ahue, Derrick DePledge, Colin Stewart and Alicia Tanaka. PMWG photo 2013. Your bargaining committee met with representatives of the company on Wednesday and Thursday in Waikiki to discuss a new collective bargaining agreement. The guild suggested that the scope of the negotiations be narrowed to focus on about a half dozen priority issues, including wages, job security, medical and management rights. The guild proposed a pay raise, signing bonus, and a one-year no layoff clause but also indicated that workers would be willing to pay a greater share of medical insurance premiums – 5 percent for Kaiser, up from zero; 15 percent for HMSA and HPH, up from 10 percent. The company would pay 95 percent of Kaiser premiums and 85 percent of HMSA and HPH premiums. The guild also proposed that management be allowed to subcontract work in the mailroom and ad production through voluntary termination incentives, or buyouts. If an insufficient number of workers volunteer and layoffs become necessary, the no layoff clause would be lifted and the workers targeted would be eligible for enhanced severance packages. The company rejected most of the guild’s proposals but took the subcontracting recommendation under advisement. The company also proposed to cover 75 percent of medical insurance premiums, up from 72.5 percent in the company’s last offer. Under the existing contract, the company covers 100 percent of the Kaiser premiums and 90 percent of the HMSA and HPH premiums. The guild has told the company that greater cost sharing for medical would only be considered in the context of wage increases. The company has proposed no wage increases. The guild also presented the company with an extensive information request to help the guild respond to the wide range of contract changes the company has sought since talks began last August. The information request was prompted by the company’s decision not to narrow the scope of the negotiations. The next round of negotiations is scheduled for June 5 and June 6 in Hilo. The Hawaii Guild has long been based in the Hawaii Government Employees Association building at 888 Mililani St., near the historic seat of Hawaii’s independent monarchy. The new office is smaller, adjacent to the old office, but still fits both Honolulu headquarters of the Guild and Typographical Union. 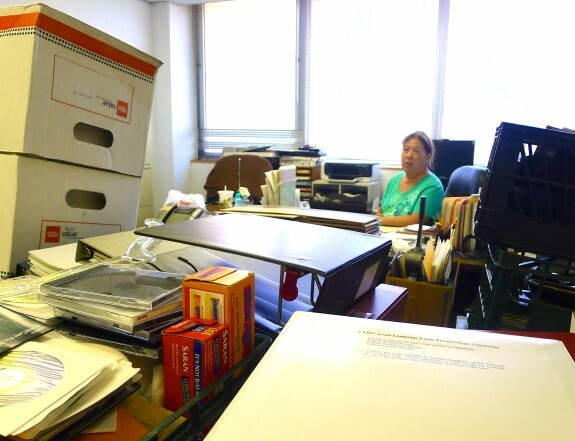 Business manager Heather Ahue was surrounded by boxes and decades’ worth of union paperwork on Friday while moving the Pacific Media Workers Guild’s Hawaii operations into compact new office space in Honolulu. PMWG photo 2013.